UPDATE: Exciting news for Annabelle, read all about it at the CaringBridge site. Annabelle Wadle was born on June 20, 2003. She was beautiful, with dark curly hair, blue eyes, and dark skin coloring. She quickly turned blond, very fair-skinned and became a spunky little girl. 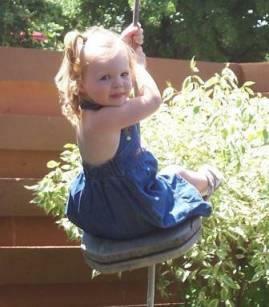 At 17 months old, Annabelle slowly started slipping away. She became extremely lethargic, clingy, and cranky. After 18 months of age, she was evaluated for poor growth and lethargy. After multiple evaluations she was found to be in liver failure and she was transferred first to Sioux Falls and then to Omaha. After initially being evaluated for a liver transplant, Annabelle was diagnosed with Ornithine Transcarbamylase Deficiency (OTC). This is an inborn error of metabolism, specifically a defect in the urea cycle. OTC is a life-threatening condition. Basically she lacks the ability to break-down protein. Annabelle has been treated with a low-protein diet and medication since she was diagnosed. However, recent medical incidents, high ammonia levels and seizures, have led her family to the decision that a liver transplant is in her best long-term interest. A liver transplant is the only cure for OTC, but it comes with its own risks. They decided on having the transplant done at St. Louis Children’s Hospital because of their great transplant team. Family and friends of Annabelle are raising money to pay for uninsured medical expenses associated with her liver transplant. They have established a fundraising campaign with HelpHOPELive. HelpHOPELive provides both tax-deductibility and fiscal accountability to all contributors. Financial gifts are tax deductible and contributors can be sure that donations will be used only to pay or reimburse medically-related expenses. For more information about Annabelle’s fundraising efforts, please contact HelpHOPELive at 800-642-8399. To email this page directly to others in your community, who might wish to learn about this campaign, click the email button and type in as many email addresses as you wish. To follow Annabelle’s story, visit her CaringBridge website (link listed above). Please take the time to check out the photos of Annabelle. Under the Links section, there is a link to send Annabelle a greeting card once she is in the hospital. Annabelle’s family feels very comfortable in their decision about liver transplantation. Annabelle is a fighter. They have never given up hope that she would be cured from this disease. They appreciate all of your thoughts and prayers and trust that God is taking care of his little girl.